Nikita Khruschev with Antonin Novotny in Prague, during Czech-Soviet friendship rally. August 1964. 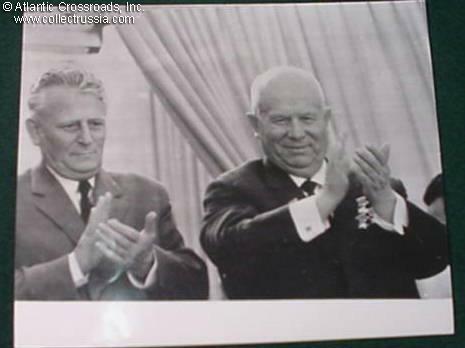 Both leaders are soon to be removed from power - Kruschev the following October, and Novotny in 1968, in the aftermath of the "Prague Spring" and Soviet invasion of Czechoslovakia. Fine official photograph, about 8x6" Excellent condition, with press release statement on reverse.